The Asteraceae (Compositae) family are commonly known as the daisy or sunflower family. The scientific family name Asteraceae has superseded the name, Compositae. You may occasionally still find the Compositae family name in older reference sources. Each flower-head is made up of many small flowers (known as florets). This gives the appearance of a single flower, an infloresence. The flower-head is called a capitulum. Surrounding the capitulum there is a collar of bracts usually in one to four rows. Leaves are usually alternate, though sometimes opposite, and simple. Without stipules. Many are basal rosettes (Lawrence). Regular readers will no doubt have guessed Calendula officinalis (marigold) is a particular personal favourite. I have mentioned this medicinal ally so many times. It seems about time I gave this particular beauty her own post. Usually named pot or garden marigold (Bremness). Medicinal marigold should not be confused with the garden variety commonly also known as marigold with the scientific name Tagetes. It is a particularly easy ally to grow. Bremness advises the preferred habitat is wasteland in a fine loam soil in the Mediterranean. Hey suggests the plant prefers a sunny position in a well-drained soil growing best in Southern Europe. She advises germination is rapid and the plant will flower for most of the year if the weather is mild. 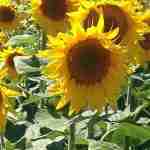 Grieve recommends growing from seeds which will germinate in any soil in a sunny or half-sunny location. My own personal experience here in France is that it will indeed grow for most of the year. It can lose flowers in particularly hot, dry weather so I find it best to harvest early summer here. The image above was taken on the outskirts of a French village in March. Culpeper mixed juice of marigold leaves with vinegar for bathing hot swellings and it reputedly provided instant ease. Flowers were used in broth or tea to comfort the heart expelling any malignant or pestilential quality. Cultivated in kitchen gardens and used in cookery and medicine. Given as a cure for headache, red eyes and toothache (Grieve). Where to start?? This medicinal ally has so many uses. Bone, Mills, Hoffmann and Bartram all discuss use of flowerhead or petals. Mills advises if the tincture has a high resin content it will have a strong antiseptic and anti-inflammatory action. This he recommends for treating infections particularly those of the mouth and throat. The astringency of the herb makes it effective to stop bleeding. Infection of the digestive tract is a further indication. Extraction of the resinous properties for tincture of marigold requires 90% alcohol. Hoffmann recommends externally for bleeding, bruising, minor burns, skin inflammation, strains and wounds and internally to relieve the gall bladder or indigestion and for gastric or duodenal ulcers. He further recommends the herb for painful periods but in particular for delayed menstruation. Marigold has a healing and protective effect beneficial taken internally for food allergies or intolerance. The depurative effect is cleansing for blood and tissues. Topical uses of Calendula in a cream include for varicose veins or application around ulcers (Mills). Bartram suggested Calendula following all surgical operations. I imagine this indication similar to orthodox antibiotic prophylaxis. Bartram also used for many enlarged, inflamed conditions including those of the lymphatic glands. Externally he recommended use for nose bleeds, abscesses, chilblains and stings. Weiss found Calendula useful in wound healing although inferior to echinacea and arnica but always well tolerated. I personally would not consider it inferior preferring to say it is different in indication and use. Bone indicates Calendula for internal treatment of ulcers, enlarged or inflamed lymph nodes, acne and sebaceous cysts and also for spasmodic conditions such as dysmenorrhoea. Topically the indications include eczema, varicose veins, haemorrhoids, acne and wounds. The constituents include bitter glycosides, carotenoids, essential oil, flavonoids, mucilage, resin, sterols and triterpenoid saponins. Bitters have similar actions to gastrin and therefore protect digestive tract tissues, promoting bile flow and enhancing pancreatic function. Flavonoids provide some of the anti-inflammatory and antiseptic properties and the mucilage soothes the digestive, urinary and respiratory tracts helping to calm irritation. Resins contribute to the acrid, astringent taste but resins also have strong antiseptic properties. Saponins are anti-inflammatory (Mills). Polysaccharides from a few herbs including Calendula officinalis have been shown to increase phagocytosis (Bergner). The World Health Organisation summarise some studies which highlight the actions. A tincture of flowers suppressed the replication of herpes simplex and influenza viruses in vitro studies. Flowers inhibited growth in vitro of Trichomonas vaginalis. Oxygenated terpenes appear responsible for the antimicrobial activity. James notes the sun ruled the heart, circulation, and the vertebral column. All plants that appeared solar, such as Calendula fell under the influence of the sun. Tobyn notes Calendula energetically is moistening in the 1st degree. Such herbs soften, smooth and soothe. The name is thought to derive from Greek ‘helenion’ meaning ‘Helen’ possibly from Helen of Troy. One story describes the plants growth from her tears. The common name is derived from two Latin words ‘inula campane’ meaning ‘of the fields’ (Phillips). Podlech describes the natural habitat as fields and rough ground. Elecampane can be found growing throughout Western and Central Asia and Europe. It can also be found in the British Isles. Bremness suggests the plant prefers damp meadows and shady soils. It can grow up to 10ft. Personally I think it will probably grow in most ground with a preference for damp soil and some shade. My own plant in the garden is around 5ft tall. It is in full sun for most of the day. I believe flowering would have lasted longer had my plant had a damper, slightly more shady spot. The flowers in this post are all from my garden in early July. Manniche notes the Ancient Egyptians called species of Inula ‘fleabane’ and used it to combat fleas. They found it disliked by most animals. Mentioned in the Book of the Dead to drive away crocodiles. Pliny tells it was an antidote to poison. Apicius recommended elecampane as a condiment for digestion. Dioscorides mentions Egyptians used the root in a wine as a snake bite remedy. Culpeper described Elecampane as hot and dry and wholesome for the stomach advising it would kill all worms in the belly. He described it as poison resistant and recommended it for shortness of breath and coughs. Used in an ointment for scabs and itching. Culpeper noted it would make the skin clear. The Shakers called the herb Scabwort. They used the herb for itching as well as weakness in digestion. However, use was mainly for coughs and lung disease (Miller). Mességué believes it one of the oldest plants used in healing noting it used in the Middle Ages in Athens and Rome for many respiratory conditions. The Germans reputedly made elecampane wine, an effective plague remedy, which they called ‘St Paul’s Potion’. Mességué talks of being a child and his father using elecampane to treat and cure a child of whooping cough. A simple treatment with baths and infusions of elecampane. A wonderful example of the power of nature. Many traditional uses relating to the respiratory and digestive systems are still common today. Bone includes asthma, bronchitis, catarrh, infections and influenza as indications. Elecampane, he describes, as a possible treatment for peptic ulcer disease and intestinal worms. Frawley lists analgesic, antispasmodic, carminative, expectorant and rejuvenative in the list of actions. He indicates the herb for pleurisy, dyspepsia and nervous debility. If using as a diaphoretic expectorant he recommends combining use with ginger, cinnamon or cardamom. As a rejuvenating tonic he suggests combining with ashwagandha, comfrey root or marshmallow. Indeed, Mességué too found elecampane to ease heartburn. He also found it sudorific. The root contains sesquiterpene lactones including alantolactone and isoaltantolactone (Bone). Menzies-Trull includes 44% inulin, terpenoids, sterols, resin, mucilage and up to 4% of volatile oil. Pengelly states inulin helps stabilise blood sugar suggesting this herb may be useful in cases of hypoglycaemia. The constituent also has diuretic and immuno-stimulating properties. Alantolactone has an antibiotic action. Bone quotes a favourable clinical study where children were given between 9-200 mg of alantolactone for Ascaris infestation. Ascaris is the common small roundworm. Culpeper did say it would kill all worms in the belly! It would be interesting to see a similar study using the whole herb rather than an extracted constituent. However I always enjoy finding an old traditional remedy backed up with some modern scientific evidence. Mills highlights an investigation of essential oils from 22 plants. All had relaxant effects on tracheal smooth muscle. One of the most potent was the root of elecampane highlighting the antispasmodic property of the herb. Sesquiterpene lactones are believed to cause contact dermatitis in some individuals. Care should be taken when collecting this plant. These constituents are more common in the Asteraceae family. Patients with hypoglycaemia or diabetes are well advised to seek the advice of a medical herbalist prior to taking this plant medicine. Culpeper described Elecampane a herb of Mercury and hot and dry in the third degree. However, Tobyn interprets Culpeper as finding it to be a hot and moist loosening medicine with a relaxing effect on membranes and ligaments, muscles and tendons. I would agree that it is definitely more moistening rather than drying. Frawley describes Elecampane as Kapha reducing. He cautions use in high Pitta conditions, presumably due to the heating effect of the herb. Energetically he describes elecampane as pungent, bitter and heating and indeed there is a slight pungent bitter taste which may possibly relate to its effect on the digestive system. The pungency most likely adds to the general warmth of this herb. Simply looking at the flowerhead of elecampane, like a large sunshine and rays, gives a warm, relaxing feeling. Don’t you agree? I was fascinated by this plant which I first found growing early June on the Plateau de Bouichet in Aude. I thought it looked similar to artichoke but not quite right. I later discovered it to be a Leuzea sp. It is indeed, an Asteraceae, same family as the artichoke. I have been unable to find any traditional or modern medicinal uses for the species growing here in the Aude. However, some scientific research to detect the presence of phytoecdysteroids has been conducted on a species known as Leuzea carthamoides. This species does include phytoecdysteroids. Phytoecdysteroids provide an adaptogenic action. The L. carthamoides species is indigenous to regions of Siberia, Mongolia, Russia, Slovakia and Poland. It is more commonly known as maral root. It was traditionally used for overstrained muscles, for fatigue and for weakness following illness. You may see pharmaceutically prepared Leuzea extracts. Please note this is not to be confused with the plant images here which were all taken in the Aude, France. I am not aware of any similar traditional medicinal use for Leuzea conifera. L. carthamoides has since been redefined and is now scientifically known as R. carthamoides. For anyone near or planning on a visit to Kew Gardens in Richmond, London be sure to check out the fabulous Leuzea conifera in their Davies Alpine House.